Here is a scoop. A company in New Jersey that licensed the name Polaroid is about to introduce a new digital camera that also prints pictures. It should sell around $149.00. 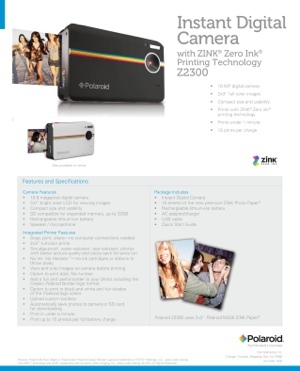 Yes, it is both a digital and instant print camera. Apparently there is a sizeable audience who wants printed pictures on-the-spot. Some of them could be music fans who want artists to immediately autograph their photos. Others are birthday party planners who like to post pictures on the walls during events. Another possibility are exercise or sports instructors who use instantaneous photos for coaching purposes. does now. It hasn’t been introduced to the world yet. It debuts next week. This entry was posted in digital, senior lifestyle, tech and tagged digital cameras, Polaroid by loiswhitman. Bookmark the permalink. Looks amazing! Love my polaroid and the weird old looking photos it prints.